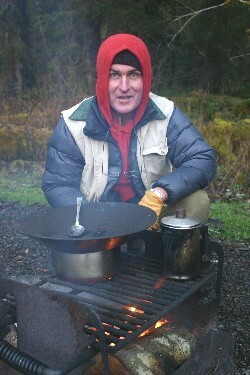 Below is a profile I wrote about Gordon Hempton, the creator of One Square Inch of Silence in the Hoh Rain Forest at Olympic National Park in northwest Washington state. It appears in the July/August of Ode Magazine, with photos by Wessel. The entire issue is dedicated to silence and is well worth a read. Hearing the chirp of a bird in the distance, I expect our unofficial park guide to identify another animal resident here in Olympic National Park, as he had earlier with the call of a Roosevelt elk. “An intruder,” he whispers in a serious tone. As Hempton whips out a hand-held sound meter from his bike messenger bag, I realize it’s not a birdsong but the drone of an airplane in the far distance that has brought him to attention. “1:19,” he notes in an official voice, reporting the time while opening up the instrument that charts noise level on the decibel A scale, the easiest way to measure the weight of sound. The intrusion, he reports, is twice as loud as the natural sound, based on the logarithmic formula of decibels. “I’m not going to do anything about it because it’s not in One Square Inch,” he adds. Although the claim is arguable, it is certainly plausible. 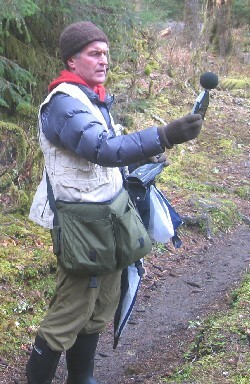 Hempton, a 55-year-old Washington-based natural sound documentarian and audio ecologist, is one of the world’s top sound recordists. He’s measured sound in hundreds of spots across the country and the world, and has witnessed, painfully, a sharp decline of spaces devoid of mechanized sounds. “I don’t want the absence of sound, I want the absence of noise,” he says. Hempton’s professional credits include radio and television documentaries, a collection of 53 natural-sound recordings, and an Emmy award for the 1992 PBS documentary “Vanishing Dawn Chorus.” Next spring Simon and Schuster’s Free Press will publish “One Square Inch of Silence: One Man’s Quest to Save Silence in a Noisy World,” a book Hempton is co-writing with journalist John Grossmann. “The logic is simple,” explains Hempton, who lives in the tiny town of Joyce, two hours northwest of the park. “If noise can impact many square miles, then a natural place, if maintained in a noise-free condition, will also impact many square miles. When you defend one square inch, in today’s world you help manage, to some degree, thousands of miles. 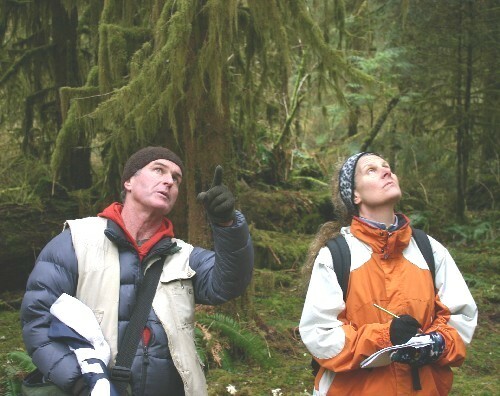 While Hempton keeps One Square Inch focused on Olympic National Park, he hopes others will pick up the mantle across the country and beyond. Here, in the brilliantly green rain forest on the Olympic Peninsula, Hempton relishes pointing out the instruments of nature’s symphony. Living in these mossy, fern-blanketed old-growth forests are some 300 species of birds, and we are treated to the calls of many, including bald eagles, western winter wrens, and the thumping bass beats from the wings of the ruffed grouse taking flight. The park is home to one of the country’s largest herds of wild Roosevelt elk, which we hear first and later see, and its rivers hold some of the healthiest runs of Pacific salmon outside of Alaska. Then there is the almost-constant precipitation, with its percussive chorus of drips, drops, pings, and poundings. The air feels so thick and rich that every few minutes of our walk, I stop and draw a deep inhale through my nose. Although I don’t carry a sound meter, I do relate to Hempton, and have been known to drive myself and others a bit nuts obsessing over mechanical sounds. I fly out the door of my house if a truck is idling to ask the driver to please switch it off. “Do you hear it? Can’t you hear that car?” I’ll implore to camping friends at the faintest engine sound off in the distance. Indoor noise bugs me, too. Blow dryers, electric shavers, vacuum cleaners, bean grinders, blenders. They all make me crazy. I can just as readily conjure a list of favorite natural soundscapes. There were the few days I spent in the Sahara Desert when I heard only the constant wind, or the July night when I sat on the edge of the woods in southern Illinois listening to crickets so deafening I couldn’t hear my friend talk. Last year, my husband and I spent a pitch-black night in a North Carolina swamp listening to owls screech and river otters splashing without ever seeing them. My favorite sound in the woods is when the wind causes two branches to scrape together in a creaking groan right out of a horror-movie soundtrack. The sounds that started Hempton on his journey came from on high during a muggy summer night in the Midwest. Armed with an undergraduate degree in botany from the University of Wisconsin in Green Bay, he was on his way from Seattle to graduate school in plant pathology at the University of Wisconsin in Madison when he took a break in Iowa. Hempton is relaying this story while driving us along curvy Highway 101, which leads to a road that dead ends in the Hoh Rain Forest. When making a point, Hempton fixes such an intense gaze on me with his clear green-brown eyes, one greener, one browner, that I fear we might run off the road. 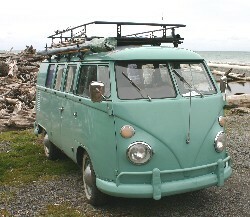 That would be bad enough in a newer vehicle, but we are in “the Vee Dub,” his pale-green 1964 Volkswagen Bus. I don’t feel unsafe, just aware of the thin metal surrounding me, the lack of a shoulder harness, and the inefficient job being done by the van’s slow, squeaky windshield wipers. “They sound like a nice relaxing swing on the back porch,” Hempton says, perfectly nailing the noise. Hempton also owns a 2000 Jeep Grand Cherokee, but prefers the bus when he’s not needing to lock up $50,000 worth of recording equipment. Hempton has the bus retrofitted for camping, with a fold-out mattress (although he usually sleeps on the ground or up on a rack hung between trees), water storage, and even a tiny wood-burning stove. Although he might sound like a ponytailed holdover from the ‘60s, he more resembles an Eagle Scout, with short hair and a clean-shaven, angular face. To support his habit, he took a job as a bike messenger. Hempton had plenty of time to ponder that when he became bedridden with pneumonia. That became the idea behind the 1992 documentary “Vanishing Dawn Chorus,” in which Hempton recorded the sounds of sunrise on six continents. 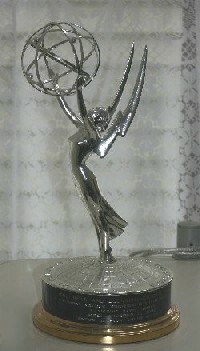 When he won an Emmy for that project, his life changed, he says. Since then he’s worked on dozens of projects, some for recordings and documentaries and others for such corporations as Microsoft and The Relaxation Company. 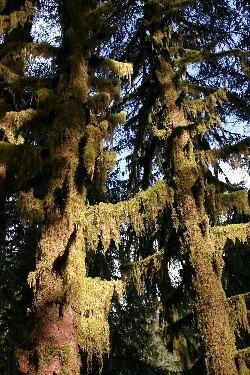 We’ve now reached our first stop, the campground at the Hoh Rain Forest, the park’s most popular section. We pick a spot next to the rushing river. Clouds hang low, and in the distance fresh snow covers the highest tree tops. Outside of the van, we add extra layers for wind and rain, but waterproof pants are frowned upon. “They make too much noise,” Hempton says. “Swish-swish-swish.” He’s the only person I’ve seen carry an umbrella in the woods. 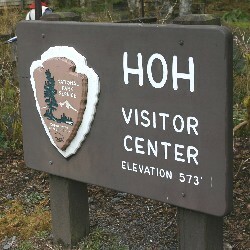 As we head toward the visitors center and the start of the trail, a gentle walk through the Hoh, Hempton stops abruptly. Finally my ears lock in to the faint but irritating hum of a generator. I’m relieved we’ve camped near the river. Before heading into the woods I stop at the visitors center, where two rangers stand behind a desk. “Do you have any information on One Square Inch of Silence?” I ask. He goes to a drawer and pulls out a magazine article about Gordon that is kept inside a plastic sleeve. As it turns out, the trail is quiet, very quiet, amazingly, wonderfully devoid of machine sounds. Only the river, birds, wind, and raindrops are audible. By the time we reach One Square Inch, volunteers with the Washington Trail Association are heading back for the day. Mostly they’re carrying hand tools, but one person is packing a gas-powered chain saw. After lunch, Hempton leads us into the thick forest toward One Square Inch following a closer but less direct route than he gives on his website, where he also GPS coordinates. In two short minutes, we’re there, in a nondescript but beautifully lush area filled with a jumble of vegetation. 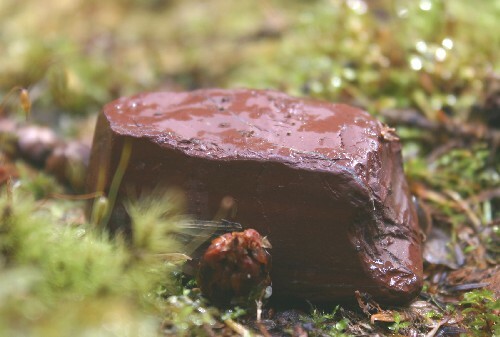 He points out the small rock he keeps atop a large felled tree limb, as well as the note-filled jar on the forest’s carpeted floor. Just as we arrive, a beam of sun appears for the first time that afternoon. We agreed to fan out and walk back separately, so we can enjoy a conversation-free return. I write a few words for the jar, thanking Hempton for bringing me there, thanking nature for existing. I read other notes, too. Some are a few words, others are longer, some are poems. Hempton requests they not be quoted out of respect for the authors. Some note writers, he says, have intimated they scattered loved ones’ ashes there. Truth be told, though I tried to feel the energy of the Inch, I was eager to return to the path where the sun could reach me — and where it was just as quiet. 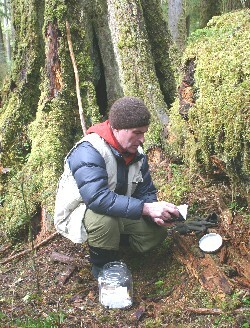 Perhaps 50 or so people have visited the site since Hempton created it on Earth Day, April 22, 2005. What would happen if it really caught on? It’s easy to be alone there in early April, but what about in the summer, when most of the park’s quarter million visitors arrived? Later I speak with Barb Maynes, the park’s public information officer, about its official position regarding One Square Inch. What gets tricky is the path, or “social trail,” that veers off the official hiking trail. Those aren’t allowed in national parks. Hempton says he followed an existing elk trail. “We do need to monitor the impact to the site,” Maynes says. 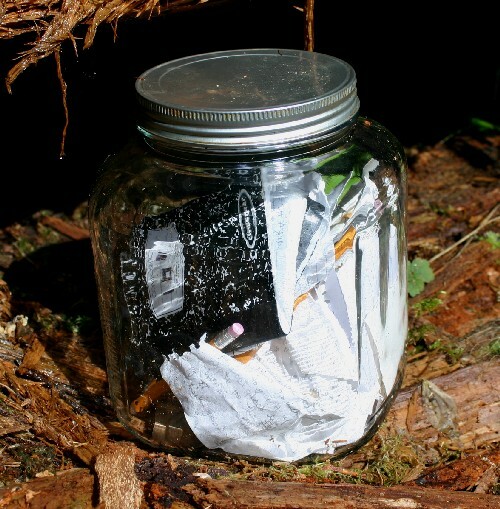 Hempton believes the jar is not damaging anything and has requested an application for a special-use permit to keep it there, though he figures it probably wouldn’t be granted — if the form is ever sent to him. What particularly galls him that a miles-long stretch of now-defunct telephone cable near the trail has never been removed. It’s clear that National Park Service representatives feel the need to walk a fine line between honoring a noble cause while disagreeing with its methods. Perhaps this job falls hardest on Karen Trevino, director of the park service Natural Sounds Program. “I’m very grateful and appreciative that Gordon is out there,” she says from her office in Fort Collins, Colo. “He’s done an amazing job of raising the specter of the issue itself. I totally support his work in general, not just One Square Inch, but his lifelong work. But my concern with One Square Inch is perhaps it’s a bit too gimmicky, and so it could stand to alienate people. It’s important for us to focus on a complete and robust soundscape program.” She doubts that a strategy like One Square Inch alone could be effective anywhere it’s not already quiet. While Hempton realizes the busiest parks, especially those with helicopter tours, are probably not ready for One Square Inch, he thinks his plan is “not only a viable way but possibly the only practical way of preserving natural soundscapes. Of course convincing airlines to alter their courses is a mighty task. When I checked with Alaska Airlines, its stance hadn’t changed since Hempton first contacted the company three years ago. Over dinner, a thick homemade chicken soup donated by a friend of Hempton’s, I asked what he would have said to the trail volunteers if they had been using a chain saw. Hempton heard plenty of opinions last summer when, as part of research for his book, he crisscrossed the country in the Vee Dub to talk with experts and regular folks about noise and quiet. Hempton initially was reluctant to take on the project, which was proposed by a literary agent, because of time constraints. “But this book is just one more opportunity to get the message to the reader that quiet is something special, one of life’s basic joys. This is one of the reasons One Square Inch was established. Along the way, he “listened to the landscape” and recorded it, and the book will be packaged with a CD of soundscapes from the journey. Hempton ended his eastward journey in Washington, D.C.,. He walked the final 100 miles on the Chesapeake & Ohio Canal trail along the Potomac River to clear his head. 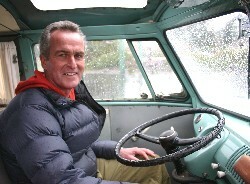 He met with as many government officials as he could, including Mary Bomar, the director of the National Park Service, and Washington state Senator Maria Cantwell, whose office is “exploring the concept of a legislative vehicle to support One Square Inch,” spokeswoman Ciaran Clayton says. While he carries a sound meter the way a photographer carries a camera, Hempton says he’d prefer to leave it at home. 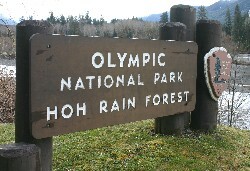 This entry was posted on July 22, 2008 at 9:57 am and is filed under Environmental, US/Canada national parks, Washington state. You can follow any responses to this entry through the RSS 2.0 feed. You can leave a response, or trackback from your own site. I live in Manhattan, the most noise polluted city in the world. And you are most welcome to try and prove me wrong in that statement. Every thing here makes a noise and is competing to be heard, and thus every noise is elevated to the pitch of deafening. Come to our city. You will not need ‘intentional listening’ to hear the high pitch of the subway turn styles beeping each time you enter and exit the subway, instead it will bombard you like an alarm (I am guessing to keep you moving out of the way of the next person), same with the buses when loading and unloading, the trucks when they are backing up, and even the ATM buttons and the scanner at the grocery stores (is it necessary that we must alarm every time a food item or toilet is scanned?) and not to mention the fire trucks, police cars, ambulances, the car alarms, the elevators and even the smoke detectors in the public hallways of my apartment building, that beeped unceasingly until I got onto the building super to deal with this issue to only find out an new alarm in the public hallway starts to beep – you see I have been trying to ‘defend my one square inch of silence’ (in my tiny apartment) but have not been able to succeed. Then I figured that somehow that one square inch is somewhere in my head, so I wear ear plugs when I go out into the public and still find myself covering my ears when an ambulance goes by. I suspect that most of these alarms and sirens are at a deafening level. Which brings me to ask, how are you going to clean up this overflowing and perpetually out of control land field of noise pollution that may soon spread to other neighborhoods like yours. Not that I am wanting to know the details of your answer but more of saying that you have a large burden on your shoulders to solve such an issue, since that is, I have it in my heart that this is also part of your calling. But you are well into your calling now and have all this equipment and a network people and hopefully even PBS to assist you in this task and I am sure in the end you will be more famous for it even if you are only able to set it in motion to tone the city down a bit.